Port Huron, MI - The battle for the Commissioner's Cup got interesting on Saturday night as the Watertown Wolves pulled off a 3-2 win in Port Huron to even the best-of-five series at 1-1. Anton Lennartsson scored at 12:40 of the third period on a Wolves power play to break a 2-2 tie. The goal stood up as the game winner, disappointing 1,279 Prowlers fans in attendance at McMorran Arena. Prowlers' goalie Michael Santaguida made 38 saves, including stopping Gavin Yates on a penalty shot late in the second period, but saw a shutout streak of 106:03 come to end in the second period when the Wolves' Cameron Dimmitt and Paul Fregeau scored twice in a span of 35 seconds at 7:50 and 8:25. Port Huron's Branden Parkhouse scored his second short handed goal of the series at 10:32 of the second to send the game into the final stanza tied at 2-2. 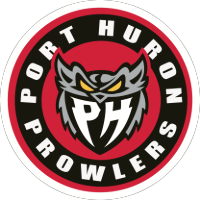 Austin Daae scored a first period power play goal for the Prowlers to open the scoring at 10:49, which gave Port Huron their only lead in the contest. Cody Karpinski made 30 saves to earn the victory for the Wolves. Game 3 of the series is set for 6:30 PM on Tuesday night in Watertown.